In this era of the internet; it is imperative that we protect our children online in the same manner as we do in the real world. For parents; it is of great significance to guide children in using the internet, teaching them its merits and demerits. Children should use the internet as a tool to gain positive experiences online, learn and use it safely. The internet opens up an exciting world of opportunities for children and the whole family. The internet is a source of entertainment, education and information. Exposure to various cultures and ways of life online, interacting with people from different countries opens up endless possibilities. It expands the horizons of children on a whole. Being online means there are no borders that need to be breached. The use of the internet involves risks and challenges that need to be addressed, particularly in the case of children. Parents have to realize and know about what kind of content their kids view online. Children can be exposed to content that is explicitly violent; prohibited or illegal. They are at risk of experiencing cyber bullying or being contacted by strangers. Children can get into serious trouble by revealing a lot about themselves by giving out personal information to strangers online; unknowingly. Two kidnapping cases have come to the forefront in Pakistan in the last year or so. The use of internet is growing among children because of exposure to smartphones and tablets. 1) Observe what content is being viewed and watched online by your children. 2) Learn about the technologies that your children are using, educate yourself well in regards to it. 3) Talk to your children about using the internet and tell them to share their experiences with you. Be friendly and cooperative while having a discussion to make them feel secure. Explain them, the risks and benefits of the content being viewed online. 4) Reach to an agreement with your children in regards to internet usage; time limitations can be put in place. Use of internet should not be allowed before going to bed for example? 5) The computer should be placed in a family area of the home for example the hallway or lounge. 6) Smartphones, tablet usage should only be allowed in your presence only. Applications and games installed being played on them should be thoroughly checked for any violence or content that is ‘inappropriate’ for your children. 7) No personal family information or photographs should be shared online without the consent and permission of the parents. 8) Install an internet filter. 9) Encrypt your home Wi-fi network with strong passwords and do not share them with your children. 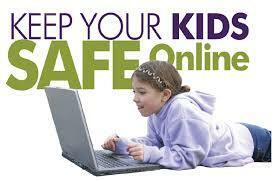 10) Monitor any explicit changes in behavior of your children after using the internet. Take them into confidence, discuss the issues that are hampering him to help them alleviate their pain.